The food available in Hanoi's narrow alleys and tree-lined boulevards is just as much a part of the city as its lakes and old world architecture. In fact, all of these elements combine with the indomitable spirit of the Vietnamese people to produce a lively culinary scene that is both diverse and confronting. Over the past twelve years, 'the god' (Van Cong Tu, author of the blog 'Vietnamese God') and 'Sticky' (Mark Lowerson, author of the blog Stickyrice) have been traversing the streets of Vietnam's capital, as well as cutting a wider arc through other regions of Vietnam and beyond, wolfing down between us virtually everything on offer. Tu is an accredited tour guide with more than 17 years experience in the tourism and hospitality industry. 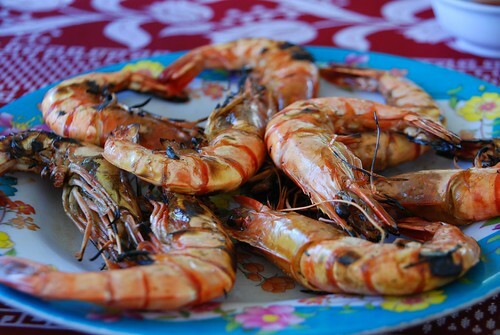 He is an expert on the cuisine of the south-central coast, having grown up in Nha Trang and frequent visits to Ho Chi Minh City and Phu Quoc Island make him very well-versed in what people are feeding their faces with in the south, too. But Hanoi is where he dwells and its chaotic web of lanes and alleys are where he eats most. Tu knows the market vendors and they like him. Mark has been resident in Hanoi since January 2002, eating on the streets here from day one. 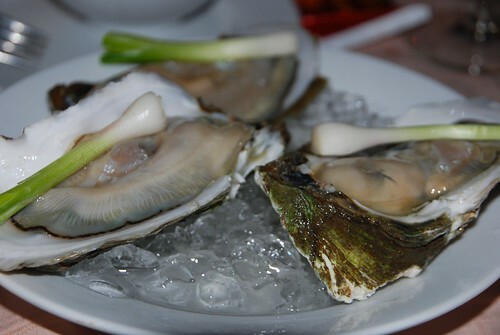 The blog 'Stickyrice' is one of the longest running foodblogs, with the first post dated May 2005. Named in The Times Online's 50 Best Foodblogs in 2009 (at #22), 'Stickyrice' has been featured on 'Gourmet's Diary of a Foodie' and as part of SBS's Featured Foodie series. We specialise in Vietnam's streetfood and wet markets and have recently designed a series of itineraries for travellers and food enthusiaists. 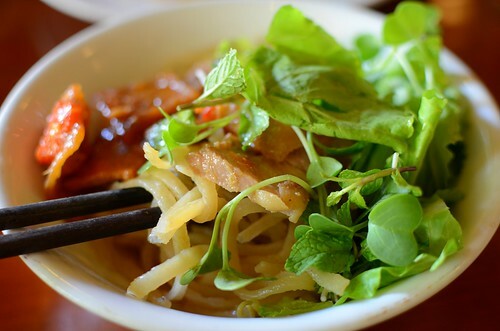 These tours have been carefully planned to give visitors to Vietnam an authentic taste of a country very attuned to the rhythms of food through the day and through the seasons. Together, we visit the street stalls and markets, sampling the produce and eating from their dishes and bowls, as well as cooking with the ingredients at home. Our tours range from three hour morning, afternoon or evening walks to a full-day eat-a-thon. The most popular tour is the 3 hour (8.30am-11.30pm) morning tour which typically includes a street market walk (with ongoing explanations of food practices, strange food items, some delicacies), a visit to ceremonial cake stalls, a special French dessert, the food sections of Hanoi's main Dong Xuan market, a streetfood alley for a noodle lunch, fruit stalls and coffee at an historic old quarter cafe. A full day (9am-3pm) itinerary for foodie tragics (including more market visits and more street snacks and drinks) is also available. It encompasses a deeper look at ingredients and is ideal for those in the food industry, whether they be chefs, food writers, indeed anyone with an enthusiasm for food, whether it be in the eating or the cooking! 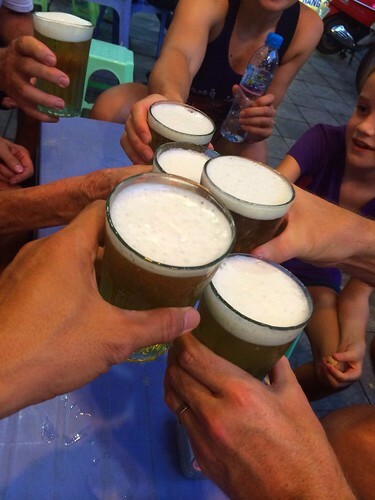 All tours are inclusive of all food/drinks and are conducted entirely on foot after Tu meets and greets at the hotel. We schedule our street food tours in the mornings, afternoons and evenings. The food landscape shifts across the course of the day and night. 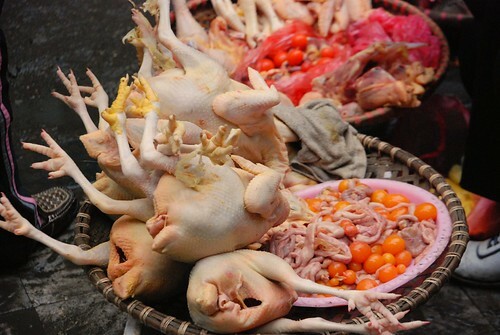 Vendors are opening with fresh ingredients and closing when they're gone, all over Hanoi. It's an ongoing tag-team of predominantly women, feeding this city out of tight, sometimes mobile, environments - in alleys, on loud busy thoroughfares choked with traffic, on their doorstep or in the front room of the house. In summer, with temperatures and humidity inducing sweat at the simplest body movement during the day, we encourage our clients to avoid the afternoons and see and eat the city in the evenings. Sweat is still inevitable but the dark at least creates the illusion of cool. And Hanoi's character changes in the dark; the locals come out of their hibernation from the sun, there's promenading around the lakes and squares, kids everywhere, and it seems every scooter owner in the city is out catching a breeze. Visually, it remains eye catching. Dusk turns to dark in the amount of time it takes to eat a banh my. Fluorescent lights are flicked on but there's a lot of soft yellow light emanating from bulbs hanging from awnings or trees, to shed light for eating and drinking. Or displaying produce or goods. The Vietnamese are masters of the hastily erected money-making stall, whether it be for sale of second hand shoes, a selection of cut fruit coated in chilli salt or dried squid grilled gutter-side. And, Hanoi is also delicious at night. Market activity may not be as lively as the mornings but you'll see the locals bargaining for end of day meat, mobile fruit and flower vendors trying to offload before they lay their weary bodies to rest. Street food eating opportunities still abound. Pavement grilling and enthusiastic beer drinking hit their peaks when the sun goes down. And the little plastic stools beckon. 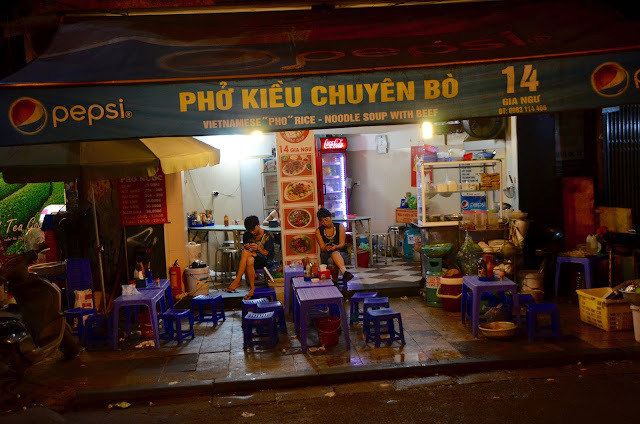 Our street food experiences don't end with Hanoi. We're not that one-dimensional. 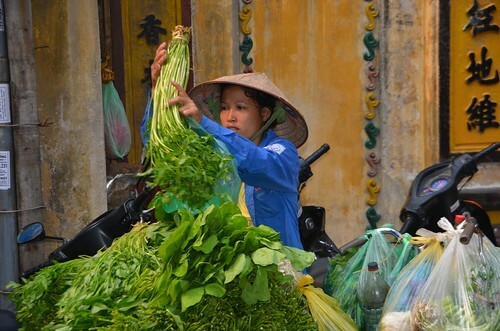 While we eat with our clients in Hanoi, guiding them through the dishes, walking through the markets and helping them to peel back the layers of the city - to see it a little bit as we see it - our food expertise does extend to elsewhere in the country. Oh yes, we've been eating at tables in the centre and the south of the country whenever we've had the opportunity over the years. And we continue to do so. The places in Vietnam that we find ourselves in - when we're having a break from the tables of Hanoi - are often the same ones that our clients are venturing to later in their trip. So we like to share what we know in a follow up email. We hope that the skills we give our clients to navigate the amazing street food of Vietnam, they can then utilize on their own both after the tour in Hanoi and then in their onward travel. We want them to eat the good stuff throughout their journey. 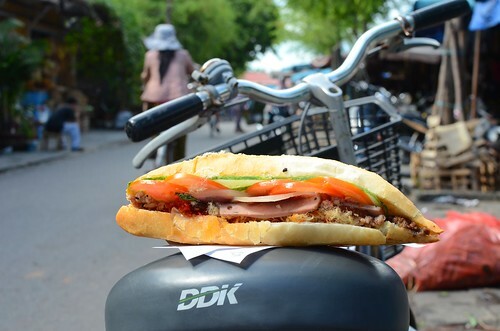 We tell them to wait until they reach the centre and the south to seek out Vietnam's incredible sandwich, the bánh mì. People are surprised to find that it's not done so well in the north of the country. 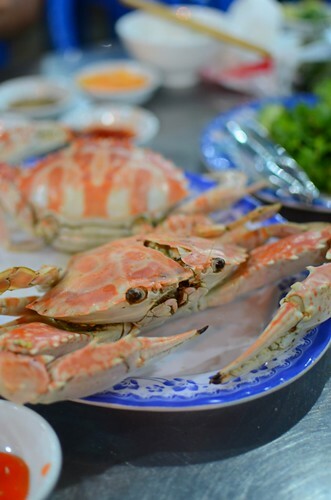 Finer versions - with all of the classic ingredients - are being assembled in Hội An and Saigon. 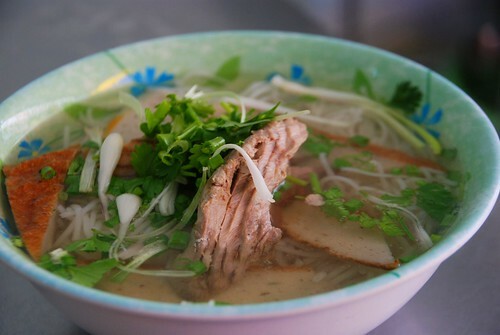 Dishes like bún bò Huế - a ballsy meaty lemongrassy noodle soup - should of course be eaten in Huế, the ancient capital in the centre of the country. 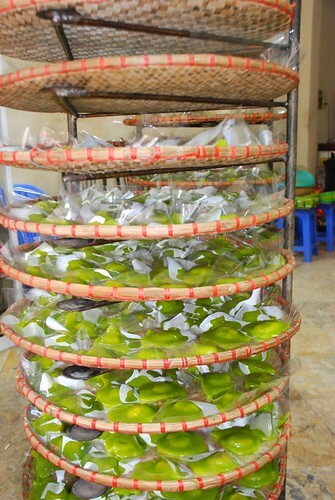 There is also the unique range of savoury cakes steamed in leaves, and dunked in very spicy nước chấm. 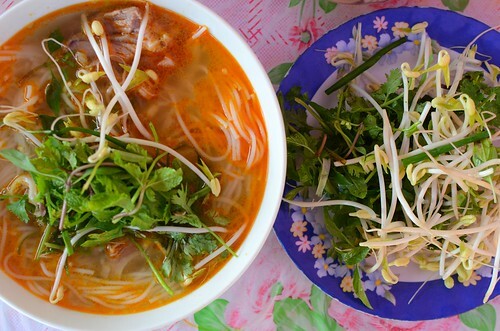 Huế gets kudos because of its historic sites and proximity to the Vietnamese DMZ - but we view the city as one of the very best to eat in, especially if a bit of local knowledge can be procured. Like the locals, we wait until we hit coastal towns like Danang and Nha Trang before we down any saltwater fish and seafood. It's common sense. In Hanoi, we eat freshwater swimmers. 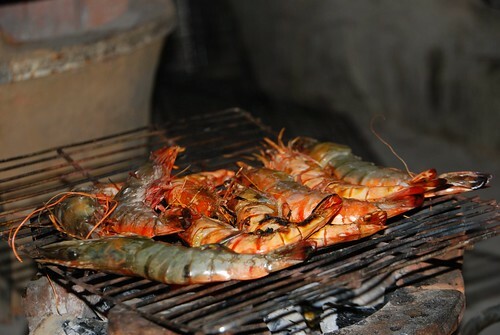 In the coastal cities, we follow the crowds to seafood barns where we select the fish or squid or prawns - whatever has been caught that day - we pay by weight, we instruct the waiter about how we want it cooked - and we gourmandize! Vietnam is a fine place to eat. There are many different tables across the country. Sometimes it might be a dish interpreted in a different way - using ingredients on hand in that region. Certain dishes are only eaten in certain locations. A dish originating in one city might be a poor imitation cooked in another city. We do our best to impart these nuances to our clients both during the tour in Hanoi and in the follow up. The beginning of Hanoi's 2014 summer has been brutal. The first heat wave of May has continued now for a few weeks, with high temperatures combining with high humidity to sap the energy out of even the most heat-hardened of the population. But we must soldier on through it for now. The rains will come and we will get used to it to an extent. 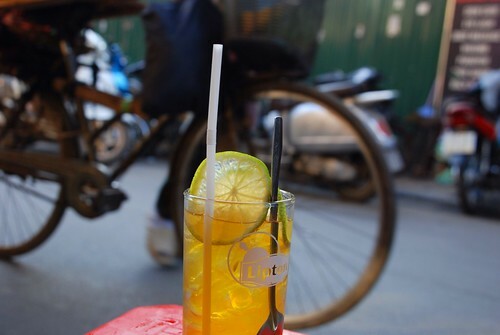 And we will keep our clients well hydrated as we amble slowly - in the shade - from one Hanoi street food table to the next. If appetites for food are down, we will down more drinks. Hot coffee? No - we recommend it with ice. 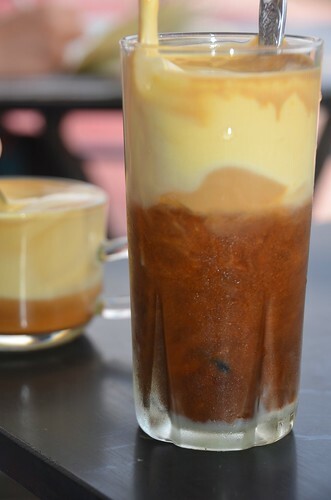 Truth be told, Vietnam's climate - apart from a few months of cool weather in the north - means that the locals, almost without exception, are taking their caffeine with ice as a matter of course. 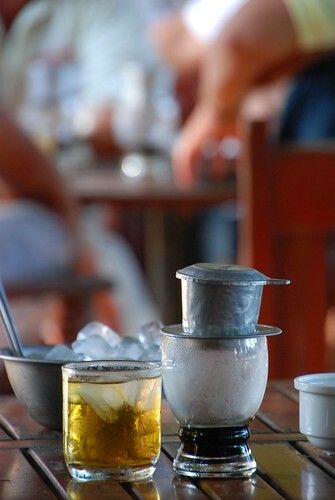 When Hanoi coffee houses brew their coffee, it is cooled to room temperature and, if a customer does want it hot, a portion is heated to a simmer in a little saucepan. On the subject of ice, many of our clients express concern about consuming ice in Vietnam, afraid that it may make them sick. These days, even street food eateries are ordering safe factory manufactured ice rather than bothering with the process of boiling water and freezing it. From time to time, ice may be handled in a dubious manner but in general, at street eateries with little or no refrigeration, if one wants a cold drink, ice it must be. Even in beer at such eateries, ice is required. Though this may go against the grain for many beer drinkers, the practice has the added benefit of providing hydration to an alcoholic drink that typically dehydrates. Hanoi's other beer culture, bia hoi (or fresh draught beer), is pulled from lengths of hose attached to kegs packed in layers of insulation and dry ice or stored in refrigerated metal cabinets. A couple of tumblers of this preservative-free, low alcohol beer is almost compulsory drinking, particularly on our evening tours. 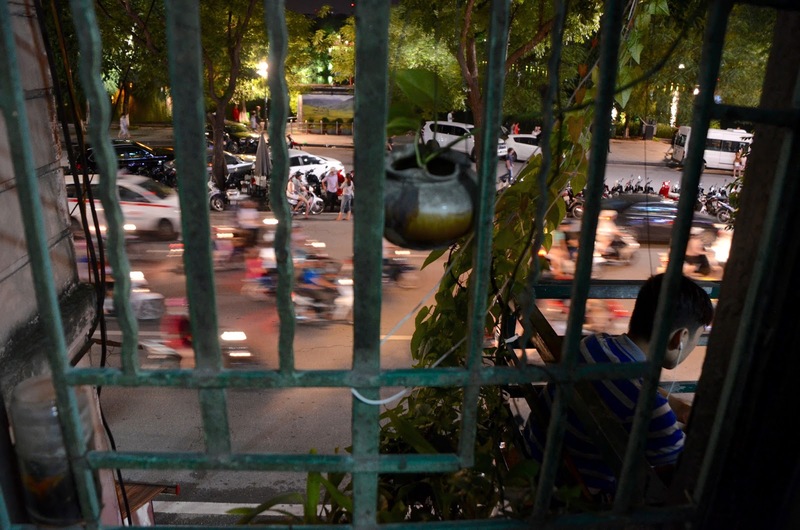 Though, in Hanoi, there is no stigma attached to drinking at any time of the day. There are soft options, of course. We carry water throughout our tours and though it may not be cold after the first five minutes in the current weather, it is wet. We eschew manufactured soft drinks in preference to those made in the city's tea and coffee houses. 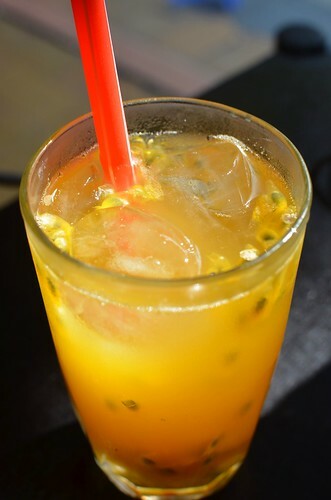 Would you prefer a Fanta or a freshly made long glass of passion fruit juice? A Sprite or green tea, sweetened with sugar, soured with lime, cooled with ice? 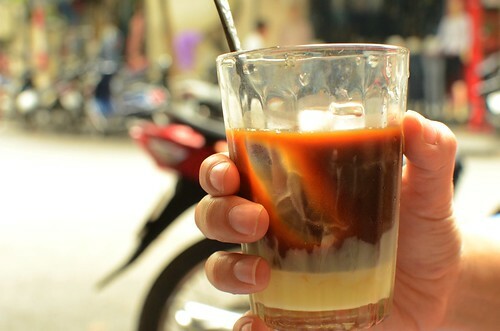 Quenching a thirst and keeping liquids up to our clients is just as much a priority in the Hanoi summer as feeding them. 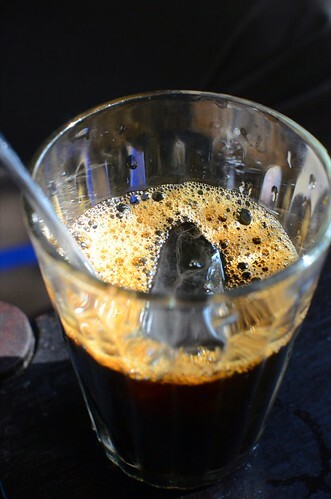 During our street food tours, we inevitably end up at one of Hanoi's local coffee shops. It's a mandatory part of all of our itineraries, morning, noon or night. 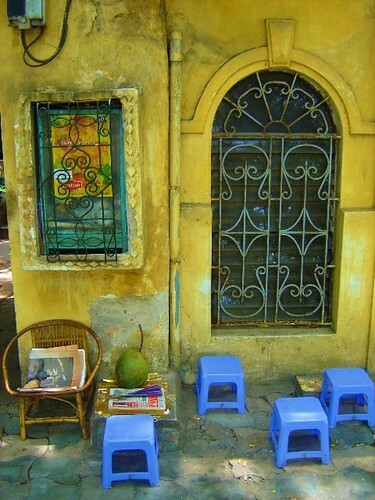 As Mark wrote recently on stickyrice, in Hanoi, coffee can be sipped "against a century old ochre wall, in a memorabilia-lined passageway a metre wide, up a spiral staircase overlooking a lake. Even a standard Hanoi cafe is perfectly good for watching the frenetic passing parade." So the experience is very much about ambience and cultural immersion. But occasionally we strike a client who self identifies as a 'non-coffee drinker'. While we try not to openly show pity, such admissions can be disheartening because the whole coffee experience in Hanoi - old-world atmosphere aside - is quite fascinating. So, to such clients, we assume the deviant role of 'drug pusher', enticing them with details that stray from the deleterious and addictive nature of coffee and caffeine, away from the side-effects of sleeplessness and anxiety, away from the notion of "I like the aroma of coffee but not the taste." We say words like sweetened condensed milk. We say words like homemade frozen yoghurt. 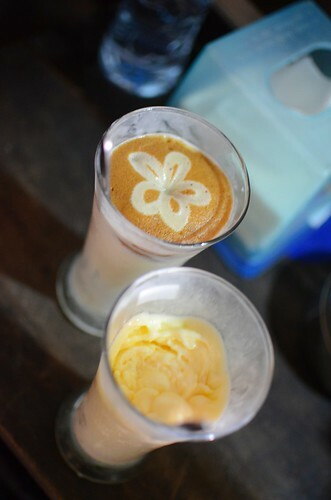 We say words like "imagine liquid tiramisu". We don't even mention the word coffee. We say "just try it "or "take a sip". Consequently, we've had feedback emails from certain clients saying that their Hanoi coffee experience was transformative. It made them see coffee in a brand new light. They are now drinking coffee back home. Some would say what we're doing is evil. 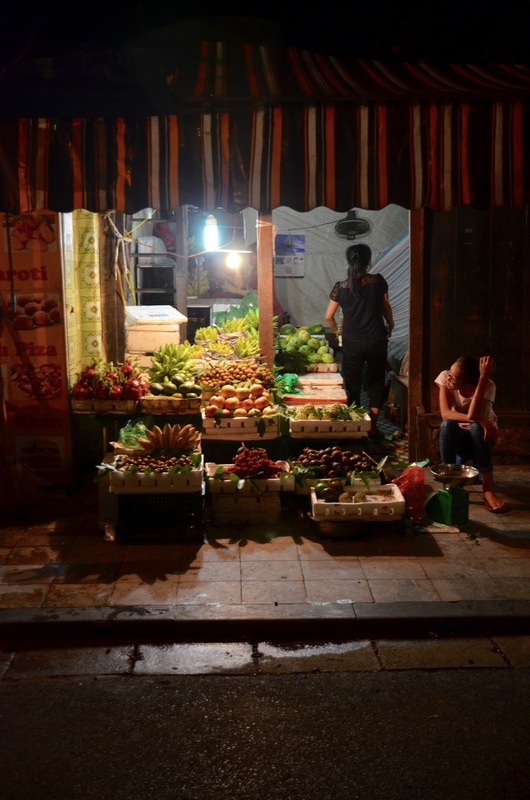 Maintaining Hanoi's image as one big bustling food shop relies on the physical toil of thousands of people, mostly women, all underpaid and under-appreciated. Smile when you catch their eye. We are taking streetfood tour operations to the south central coast for the first two weeks of February. 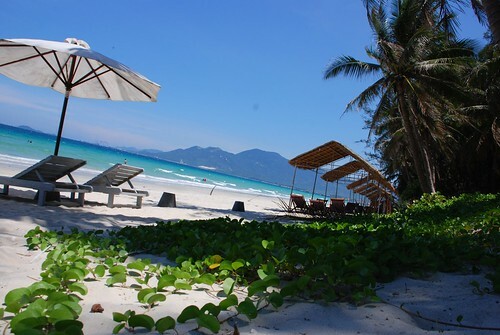 Nha Trang is a resort town a short flight from Saigon and very much on the standard tourist trail. While most visitors tend to spend their days on the beaches and their evenings at the bars - something we are not averse to ourselves - there is a fantastic street food scene in this town, one that we've been enjoying on a regular basis for the past ten years. In fact, in the case of Vietnamese God, his whole life as Nha Trang is his home town. 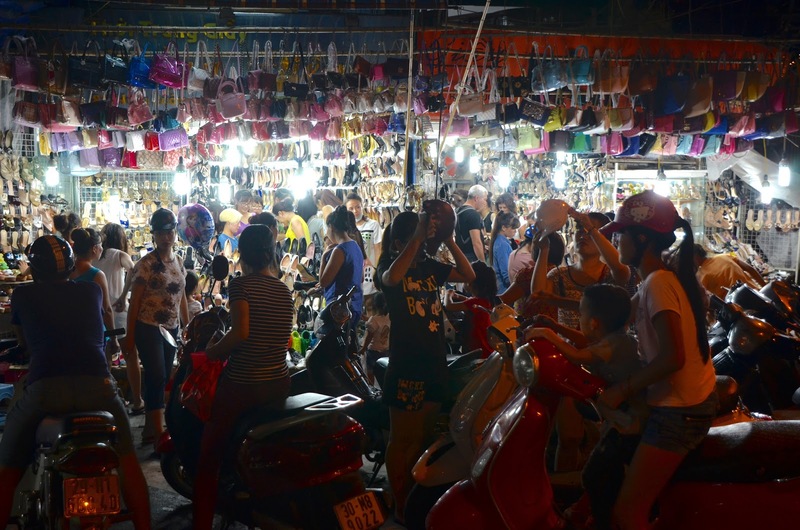 We'll be there over the Tet (lunar New Year) period, which adds a degree of colour and excitement to the atmosphere around town, as the locals hit the markets and shops in their preparations for Vietnam's biggest family occasion. But, that said, because Nha Trang is a southern coastal town, the feeling about town is still relaxed. Remember, there's always the beach. 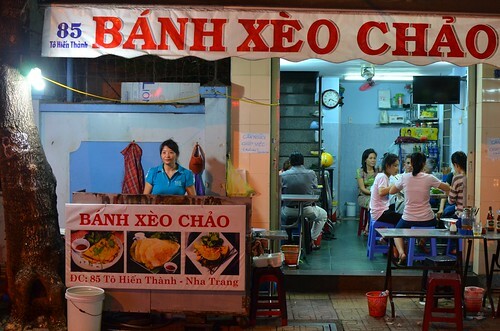 So, what does Nha Trang have to offer the food-obsessed? Seafood has to be the number one attraction. For breakfast, it could be in the form of fish noodle soup. In Hanoi, of course, it would be pho. 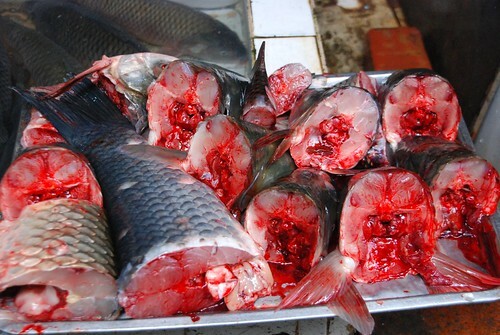 In Nha Trang, expect lovely chunks of mackeral or tuna, along with fish cake slices with your threads. After breakfast, coffee can be had street side or in a cafe by the sea. Street food eateries and restaurants alike are pandering to the hankerings of those who want to eat stuff from the sea morning, noon and night. Let's make the pictures do the talking. Some of our other favourites around town include banh mi with fish cakes, banh xeo (rice flour pancakes) with baby squid and the best spring roll in Vietnam, nem nuong. 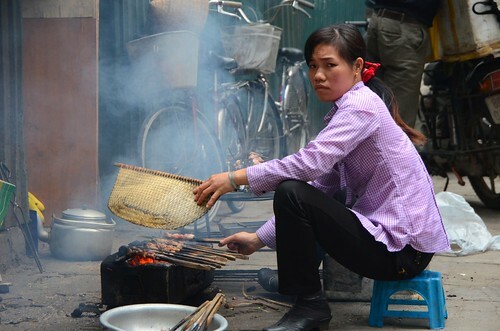 The streets of Hanoi tend to be a very foreign place for most of our street food tour clients. There's a lot to take in. A lot might be said. It can be sensory overload. 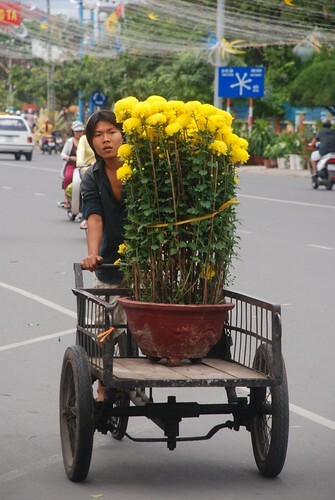 Indeed, if Hanoi is a person's first ever stop in Asia, it will most likely be bewildering and confronting. And there is no doubt that a street food tour can accentuate those feelings. While we don't want to protect or molly-coddle our clients, we do want them to have an enjoyable and relaxing experience rather than a stressful or confusing one. So we wander. And we see things and we eat and drink things. At certain points, we explain things. But we don't talk from go to woe. Much of the experience of Hanoi is about allowing time for the brain to process the message from the eyes...or the nose...or the ears. If we yack too much, it interferes with that process. But we do get a lot of questions. Like, what is that bright green thing wrapped in plastic? 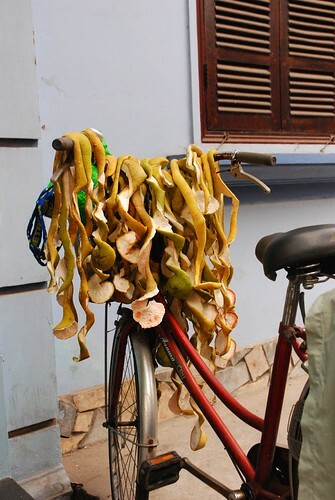 Or what is that drying on the handlebars of that bicycle? Do people really eat that? Um...and what is it? And then later, when our customers are relaxing back at their hotel, we send them some information from here and there, which they can peruse at their leisure. I suppose you would call it 'after sales service'.